Broadside view of Alhambra Rock from Highway 163. The foreground sedimentary rocks, known as the Halgaito Formation, blanket the surrounding desert scenery. Beautiful sandstone buttes, mesas, and spires dominate the landscape of the Four Corners region, a fact proven repeatedly as these sedimentary splendors grace the covers of countless calendars, and provide perfect movie backdrops. The focus of this article, however, is on the lesser known yet equally remarkable volcanic remnants known as necks, plugs, and dikes in this same region, specifically Alhambra Rock. Dozens of these volcanic landforms freckle an approximately 9,000-square-mile area in the Four Corners region called the Navajo volcanic field. Two of the most recognized names of these volcanic landforms are 1,581-foot-tall Shiprock and 1,437-foot-tall Agathla Peak, which are in New Mexico and Arizona, respectively. 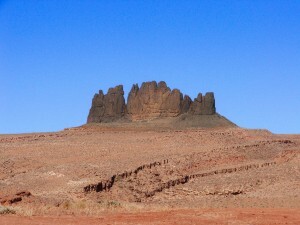 Though it lacks the towering height of Shiprock and Agathla Peak, Alhambra Rock’s stark contrast to its surroundings makes it a worthy “GeoSight.” Located in southeastern Utah, about 2 miles southwest of Mexican Hat, Alhambra Rock received its name from early Spanish travelers who thought that its profile resembled the medieval Moorish castle bearing the same name in Granada, Spain. In plan view, the volcanic features in the region are typically circular in shape with multiple linear dikes radiating outward from a central point. Alhambra Rock is strange in that it protrudes upward from a singular, very low relief, 3-mile-long dike. This dike is easily seen when looking at it on an aerial image; however, it is easily missed when driving by due to its extremely low profile (the dike’s igneous rocks eroded at nearly the same rate as the surrounding sedimentary rocks, leaving the dike very little vertical relief). If you ever find yourself driving south along U.S. Highway 163 near Mexican Hat, make sure to look to your right (west) after crossing the San Juan River and you will see Alhambra Rock jutting over 250 feet into the sky. Just do not expect to find its accompanying dike unless you take time beforehand to pinpoint where it intersects with the road. Within the Navajo volcanic field, small cracks in the Earth’s crust served as conduits along which rock fragments, gas, and magma were injected, approximately 25 to 30 million years ago, during the Tertiary Period. These explosive events left behind magma- and crushed rock-filled fissures in the crust in which the magma later cooled and hardened beneath the surface. Diatreme is the scientific term for these rock-filled fractures, but you would not hurt anyone’s feelings if you called them a volcanic plug, throat, or neck instead. The north-south trending dike emanating from Alhambra Rock is essentially a large sheet of cooled magma that has cut through the surrounding rock layers. Alhambra Rock, as we see it today, is the result of millions of years of erosion that washed away the surrounding softer, more erodible rock, leaving behind the weather-resistant remains of the ancient volcanism. Alhambra Rock itself is a menagerie of different greenish-gray igneous rocks, but also engulfs fragments of sandstone, granite, and limestone. Alhambra Rock is located approximately 275 miles southeast of Salt Lake City. From Moab, drive south on U.S. Highway 191 for approximately 100 miles to Bluff (where the highway turns into U.S. Highway 163). 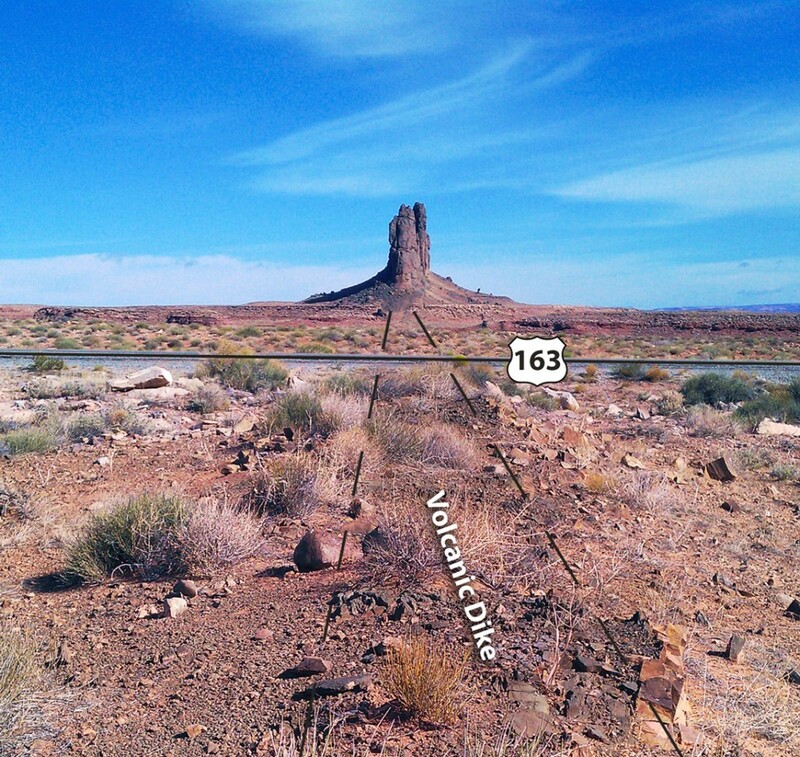 Continue west on U.S. 163 for 20.5 miles to where the bridge crosses the San Juan River. From here, continue another mile to a pullout along the west side of the highway where clear weather will allow a broadside view of Alhambra Rock to the west. To check out the dike, continue south for an additional 1.6 miles to where it intersects the highway. Alhambra Rock is visible from other nearby vantage points as well, including Goosenecks State Park, due to its relief and contrasting color. Emergency Response and the Utah Geological Survey, What role do we serve and what services are provided? Glad You Asked: What is the Boxcar Seawall?